The production line is applied to automobile filters industry, hydraulic filtration, purification and water treatment industries, etc. 1. 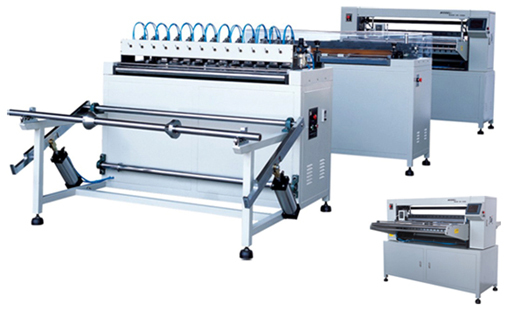 The pre-slitting machine can accurately and freely adjust the cutting dimensions through frequency converter speed regulation and cylinder blades in different filter sizes. It is simply operated but smooth and effective. After slitting the paper, the conveyor for feeding the filter paper runs in synchronism with the marking machine by equipping the infrared monitoring system. 2. The marking machine can mark in different pleat sizes; the marking distance can be set freely by the computer screen, and accurately and accurately by automatically adjusting the blades distance. 3. The pleater uses upper and lower blades to alternately finish the folding, and then different pleating heights are acquired evenly and accurately by automatically adjusting the blades distance. 4. After marking, the filter paper will be pleated and pre-heated. 5. The machine is also suitable for folding the iron wire fabric and non-woven fabric of the hydraulic filter, even the multilayer folding.